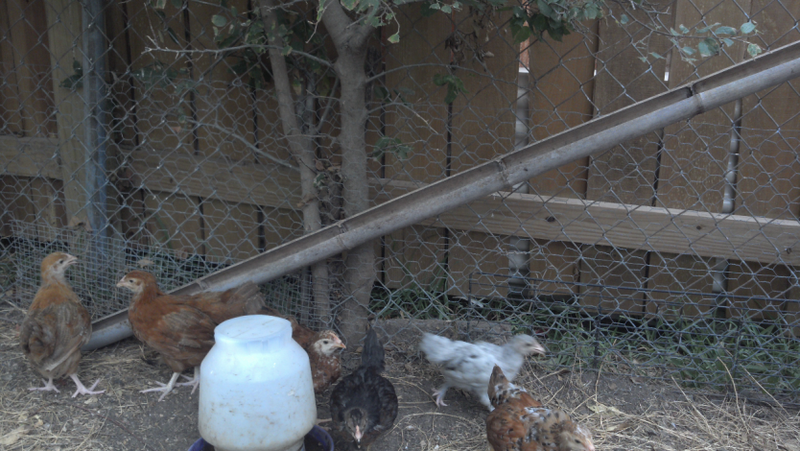 We moved the chicks out into the chicken yard several weeks ago. We’ve gotten past the “gathering chicks” stage where they must be retrieved from under the coop each night and put into the coop. Now they are beginning to explore their new world. One day I looked out and saw them sitting on the fence between the big and little chicken yards. They were eating the leaves off the tree. The problem was that they are slightly uncoordinated and would fall onto the wrong side of the fence – in with the big chickens. This was very distressing and I have spent an inordinate amount of time returning chickens to the right side of the fence. Today when I was unloading chicken feed I saw them using a piece of bamboo as a ramp. I’m not exactly sure from whence the bamboo came. 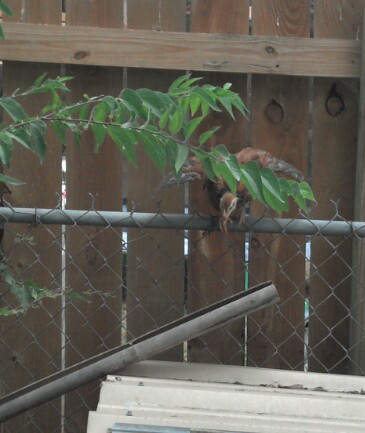 I suspect it came over the fence from the neighbor’s yard. 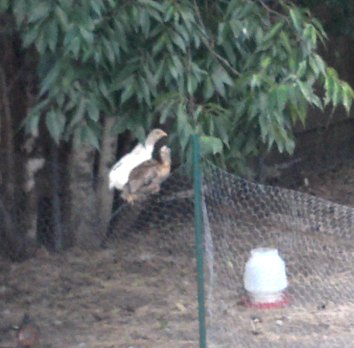 In any case, the chickens were climbing up it to get to the top of that fence. Much to my relief, the chick arrived safely back in the chicken yard. 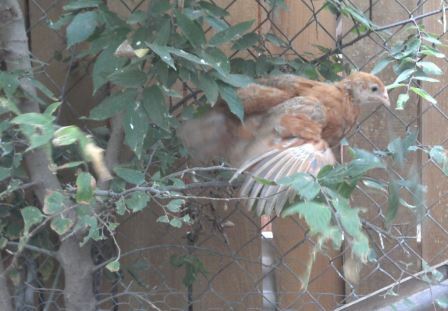 We have had to retrieve chickens from between the chain link and wood fence and it is no easy task. It reminded me of taking my children to the park when they were young. Matt climbed on everything he could find especially if it was taller than him. Alas, the mother in me came out and just as I had removed Matt from high places before he could jump, I moved the bamboo so the chickens could no longer climb on it. A little bit of danger is fine, but so far I have managed to keep all 22 chicks alive and I don’t want to ruin my record.